Dhaka, 3 Dec, Abnews: Prime Minister Sheikh Hasina today paid rich tributes to Cambodian martyrs by placing a wreath at the Independence Monument. After placing the wreath, the prime minister stood in solemn silence for some time as a mark of profound respect to the martyrs. A smartly turned out contingent drawn from three services of the Cambodian armed forces gave a static guard of honour to the Bangladesh premier, while bugle played the last post. The Independence Monument in Phnom Penh, the capital of Cambodia, was built in 1958 to memorialize Cambodia's independence from France in 1953. The lotus-shaped Independence Monument was designed by Cambodian architect Vann Molyvann. Later, the prime minister paid homage to Cambodian late King Norodom Sihanouk by laying a wreath at his memorial. She stood there in solemn silence for some time as a mark of deep respect to the late King. The premier was given a static guard of honour by the Cambodian armed forces. Bangabandhu's younger daughter Sheikh Rehana and other entourage members of the prime minister were present. Sheikh Hasina later visited the Tuol Sleng Genocide Museum. The museum is situated in the heart of Phnom Penh chronicling the Cambodian genocide. 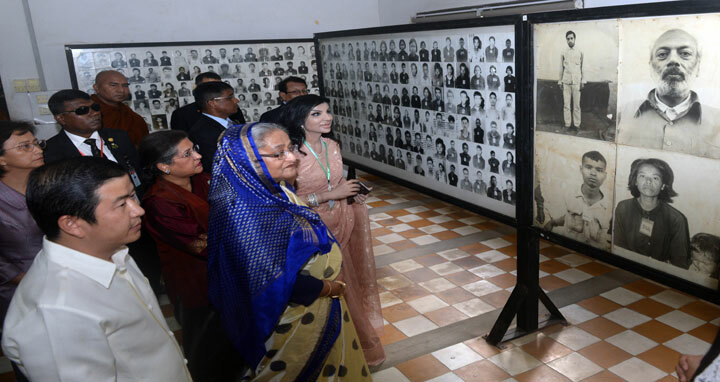 Accompanied by Sheikh Rehana, the prime minister went round different sections of the museum and witnessed the evidence of the atrocities of the Khmer Rouge regime. Director of the museum Chhay Visoth briefed them about different aspects of the museum. Civil Aviation and Tourism Minister Rashed Khan Menon, Foreign Minister AH Mahmood Ali, State Minister for ICT Division Zunaid Ahmed Palak, PM's Principal Secretary Dr Kamal Abdul Naser Chowdhury, Chief Coordinator on the SDG Affairs at the Prime Minister's Office Md Abul Kalam Azad, Foreign Secretary M Shahidul Huq and PM's Press Secretary Ihsanul Karim, among others, were present on the occasion. The museum is a former high school which was used as the notorious Security Prison 21 (S-21) by the Khmer Rouge regime from its rise to power in 1975 to its fall in 1979. Tuol Sleng means "Hill of the Poisonous Trees" or "Strychnine Hill". Tuol Sleng was just one of at least 150 execution centers established by the Khmer Rouge. On the 26 July 2010, the Extraordinary Chambers in the Courts of Cambodia convicted the chief of Tuol Sleng Prison, Kaing kek Iew for crimes against humanity and grave breaches of the 1949 Geneva Conventions and sentenced him to life imprisonment.